GTB Technologies Inc., the creator of DLP for IP and the leading Data Protection Solution system capable of inspecting and accurately detecting un-authorized sensitive data transmissions (such as PHI, PII and PCI), alerting administrators and preventing a breach as soon as the violation occurs; is accepting new enrollments, from non-profit cancer centers, to its Data Protection Donation program. The US Department of Health and Human Services, Office for Civil Rights (OCR) announced recently the enforcement action and settlement related to a HIPAA violation. This HIPAA settlement along with OCR's latest settlement for noncompliance with a major insurance company show how important the implementations of ePHI protections are. The GTB Data Protection Donation program was established in loving memory of Leslie Cohen Tully, a sister of one of the GTB Technologies founders. Leslie was diagnosed with Stage II cancer in the spring of 2002, who unfortunately, after a brutal fight, succumbed to the disease March 8, 2006; just a few days shy of her 48th birthday. "Leslie had always been the first to lend a hand to various worthy charities including Cancer Research and Treatment, both before and during her struggle with the disease." says GTB Technologies co-founder, Wendy Cohen, "We have seen firsthand that our donations help Cancer Centers avoid heavy fines and damaging publicity while achieving compliance and maintaining patient privacy. We are hoping these donations help Non-Profit Cancer Centers free up valuable funds which can then be spent on research and patient care." The GTB Data Discovery for Fileshares software tool is used to intelligently search for items including unsecured electronic protected health information (ePHI), Personal Identifiable Information (PII) and Payment Card Industry data (PCI). GTB's Data Discovery donation program enrollment period begins February 3, 2017 and will run thru March 30, 2017. All 2017 Data Discovery donation recipients will receive a license to the GTB Data Discovery for Fileshares tool, free training and free support. Would you like to receive data protection news and updates? 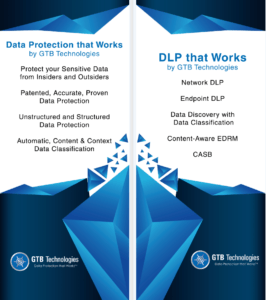 For over 13 years, GTB's patented, Data Protection that Works platform and solutions have provided the most effective security against advanced malware and insider threats for the world’s largest enterprises and are the go-to data protection solutions for the Who’s Who of global enterprises, in part due to superior accurate, granular visibility and control of sensitive data usage (either in files or file-less) for on premises, off and everywhere in-between, including sanctioned and unsanctioned cloud apps (Shadow IT). For more information, call 800.626.0557 or visit us at https://gttb.com/.